There are many long pauses during my big tower project. There are many tasks to tackle during those pauses including the preparation of antennas. One example is to redo clamps to fit a 3" (75 mm) mast. Another is to clean and refurbish ancient antennas that have been in storage for some time. It is at times like these I curse my younger self. Case in point is my venerable Hy-Gain TH6. I bought the TH6 secondhand and put it into service in 1985. It came down in 1992 when I dismantled my station and exited ham radio for many years. I liked the antenna so I stored it in my garage. Even then I cringed at the thought of putting it back into service. When acquired the antenna had the original plated fasteners throughout. This was before Hy-Gain offered stainless steel hardware kits. The boom truss hardware was also plated. Extensive rust was the result. Before raising the antenna I retuned it since the previous owner tuned it for SSB. The compression clamps on this vintage of TH6 had a screw that pulled tight a steel band surrounding the tube splices on the elements. The rusted screws were easily removed with bolt cutters. The hex head screws used pretty well everywhere else on the antenna snapped in two with the firm application of two socket wrenches turning in opposite directions. So far so good. As I recall I was in a rush and couldn't bear waiting to order a full set of stainless fasteners for the TH6. Local hardware stores 30 years ago rarely stocked stainless steel. So I took the expedient measure of using ordinary plated fasteners. Worse yet was that the screw heads were rounded and designed for a slot head screwdriver. Although I knew I was making a mistake I judged it acceptable at the time. How wrong I was. Now, in 2017, I am paying the price of that fateful decision. Only a few of the rusted fasteners could be removed with a screwdriver and wrench. Too much torque and the screw heads stripped because of the mild steel they were made of. Liberal application of penetrating oil liberated several more. The large majority required more labourious methods. The picture at left is only slightly posed for the blog. I really did have this array of tools lying on the garage floor alongside the partially dismantled halves of the boom. Notice the collection of split and shattered rusty fasteners removed from the element-to-boom clamps. Rust stains are readily apparent on the clamps, truss and elsewhere on the boom. Penetrating oil (not visible): Applied to all the rusted nuts, hoping that they'll be loosened enough to allow removal, or at least backed off enough to provide room to fit the bolt cutters or hacksaw. Bolt cutters: This is my favourite tool for this job. Unfortunately the jaws are wide and rarely could fit into the awkward contours of the clamps and bite between the nut and lock washer. The recoil of a rapidly severed screw is immensely pleasing. Be sure there's nothing valuable in the projectile's path. Hacksaw: As with the bolt cutters there was rarely room to fit a hacksaw. It worked in a few cases where the bolt cutters didn't fit and there was a narrow gap between nut and lock washer. Care is required to avoid sawing into the clamp. Cold chisel and steel mallet: This was perhaps my worst choice since aluminum clamps bend under the force of the mallet. Damaging the clamps is not recommended since bending them back into shape is not only difficult it will weaken the clamp. Aluminum fatigues easily. Wrenches and screwdriver: This was always my first choice. It was also my second choice after the application of the penetrating oil. Vise grips: Needed to grip stripped screw heads or to wiggle and break partially severed screws. Hand drill with a thin cut off wheel: Placing and holding the wheel in position between lock washer and nut was the big problem. When it worked it work very well indeed. In other cases it would kick out and gouge the clamp. The job is hours of drudgery and frustration. This is despite choosing to leave alone some of the hardware that does not absolutely require removal. Examples are the truss clamps and most of the inside screws and boom set screws on the element-to-boom clamps. 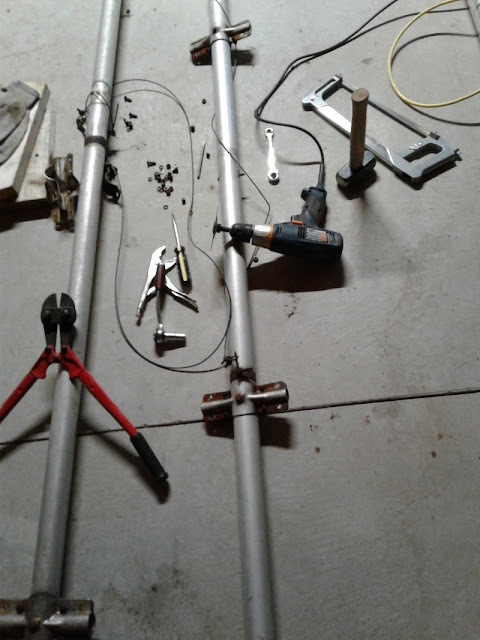 Consider that there are 60 screws alone for the element-to-boom clamps (8 on the clamp faces and 2 preventing clamp rotation on the boom on each of the 6 elements). After removal I replaced the fasteners with hex head stainless fasteners. I've had good success with a local store that specializes in fasteners. Even so so care must be taken since stainless steel comes in many varieties of alloy mix and strength. Cheap stainless is a poor choice since it can gall, break or corrode (yes, really). Unless the grade is known stainless steel is best avoided where high strength is a primary requirement. Lubrication can help avoid galling and protection against the elements. I am no expert on fasteners so I will stop with those above cautions. When in doubt you can often opt for grade 5 steel fasteners since they rust more slowly and will survive many years when liberally dosed with grease before assembly. I have had success with white lithium grease even though it is not the ideal choice. There are greases out there for every imaginable metal alloy, however choosing and finding them can be difficult. The point is that even if you do not make the ideal choice of fasteners you can achieve good results by selecting more expensive fasteners to ensure their easy removal in future. Hy-Gain sells stainless steel kits for many of their antennas. Although you can spend less by hunting them down on your own the kits are convenient. Cheap fasteners can seem attractive. Just remember to add in the cost of removal before you buy. You'll pay that price in future drudgery, or when no one wants to buy your rust encrusted antenna.